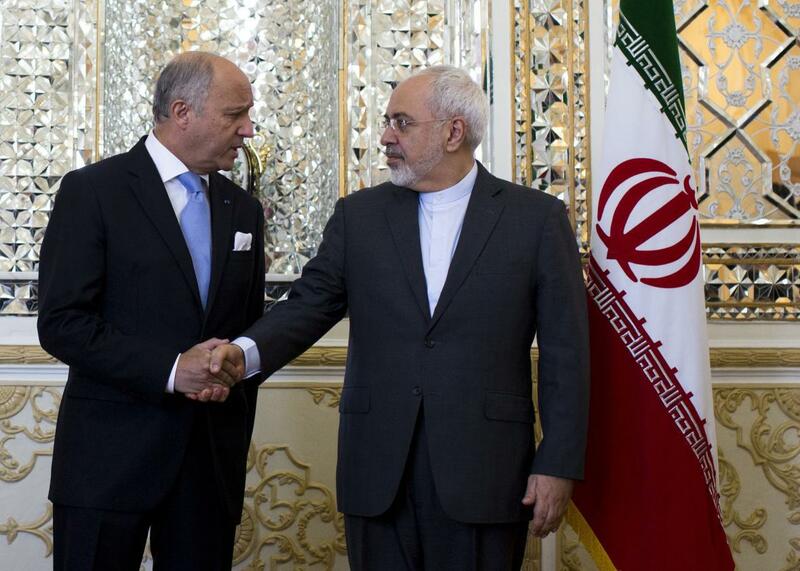 Iranian Foreign Minister Mohammad Javad Zarif shakes hands with his French counterpart Laurent Fabius prior to their talks in Tehran on July 29, 2015. With conservative Democratic Sen. Joe Donnelly of Indiana announcing that he is backing the Iran deal yesterday—along with Massachusetts’ Ed Markey, whose support was more certain—it’s looking very unlikely that congressional Republicans will be able to scuttle the agreement. Congress will vote on a resolution, likely in September, disapproving the agreement, which President Obama has said he will veto. According to the Washington Post’s whip count, 31 of the 34 senators needed to uphold the veto have already indicated their support for the deal or are leaning that way and things are looking fairly safe in the House as well. At the moment, it’s not even clear that four more Democratic senators will join Chuck Schumer and Robert Menendez in supporting a resolution condemning the agreement, meaning there’s a chance Obama may not have to use his veto at all. But even as the Congress debates, there are signs that the rest of the world isn’t waiting to normalize political and economic relations with Iran. The Guardian reports today that British Foreign Secretary Philip Hammond will travel to Iran this weekend to reopen the British Embassy in Tehran. The embassy has been closed since protesters stormed it in 2011 following the imposition of sanctions. The Iranian Embassy in London will be reopened at the same time. Other countries were even faster out of the gate to re-establish ties. Germany’s economy minister led a trade delegation to Iran just days after the agreement was inked, touting new opportunities for German business. French Foreign Minister Laurent Fabius, whose government had often been the most critical of Iran during the negotiations, visited in late July to cement political ties. A delegation from France’s main business group plans to visit in September. Things are also moving ahead on the agreement, even while Congress continues to debate it. Technically, the resolution adopted by the U.N. Security Council, which sets international sanctions relief in motion, doesn’t go into effect until October, giving Congress the opportunity to review it. But this week Iran met a deadline to submit documents about its past nuclear activities to the International Atomic Energy Agency, or IAEA. Critics of the deal, who believe it doesn’t do enough to hold Iran responsible for its past activities, are raising alarm today over an AP report that says that under a secret agreement between Tehran and the IAEA, Iran will be allowed to use its own inspectors to self-investigate a site where it has been accused of developing nuclear weapons in the past. The White House has dismissed concerns about the side deal, saying it’s about a dormant site that doesn’t pertain to the main purpose of the overall agreement, halting Iran’s work on a nuclear weapon. Despite its flaws, the report may give some more ammunition to critics who say the agreement isn’t as tough as it’s been portrayed by the White House, and that Iran will be allowed to continue deceiving the international community. But it’s likely too late. With the system of international sanctions that isolated Iran and pressured it to negotiate already unraveling, Congress is pretty much debating whether to maintain something that no longer exists.